Ship Thieves (formerly known as Chris Wollard And The Ship Thieves – members of Hot Water Music & Samiam) release their third album, No Anchor on 296th January via No Idea Records. 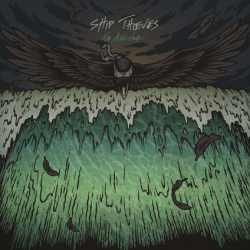 Ship Thieves was originally born as an outlet for songs and ideas that Chris Wollard was working on that didn’t necessarily fit with Hot Water Music. Now with a solid line-up and the fact that Ship Thieves is his primary song writing outlet this is the very best Ship Thieves record to date. It’ll have appeal for Hot Water Music fans, there are striking similarities, but far more than that and should be viewed by itself as completely separate. No Anchor is a storming punk rock album, crunching and infectious from the outset. You may as well forget the bands previous work, this is a different beast. It’s more cohesive and striking; it bypasses previous country-esque dabblings and goes straight for the jugular. Right from the instantaneous opener ‘Middle Man’ you’re hooked. Big melodic punk is the order of the day and from that point it continues a breakneck speed through to the impressive and imposing album closer ‘Dark Days’. It’s more than normal run of the mill punk rock, sure the tired and tested template is stuck to with rigour yet it’s the raw energy and snarl that gives No Anchor its magic. ‘Rotations’ slows things slightly with its intro before exploding into a blistering punk track with cutting guitars and a sumptuous groove that packs a punch. With ‘Born Into This’ the melodic punk goes into overdrive, think of a harsher and more raucous version of The Menzingers and you’ll be on the money. Naturally with this taken into account you’ll be unsurprised in finding ‘Born Into This’ being one of the best tracks on No Anchor. ‘Long Way Down’ delivers up more of the same; the hook is as infectious as they come; before ‘Something Is Missing’ comes over as one of the finest punk rock songs committed to record in recent times. The fact that every single track on No Anchor is of the highest standard shows just how hard it’ll be to find a better punk rock album this year. ‘Undertakers’ is another track of near perfection, Wollard’s vocal compliments the churning guitars while the chanted backing vocals make for a melody that’s as infectious as it is immediate. ‘Ruts’ is as striking and raucous as they come before ‘Dark Days’ signs of No Anchor in real style. It’s the strongest track of the album and leaves you with the lasting impression the Ship Thieves have never been better. Ship Thieves have produced an earlier contender for punk rock album of the year and it’ll take something very special to beat it. Get in on the action now.